Computer disaster preparedness has taken a new turn with Windows 10. Gone are the days when you get caught by an awkward situation like a failing hard drive. 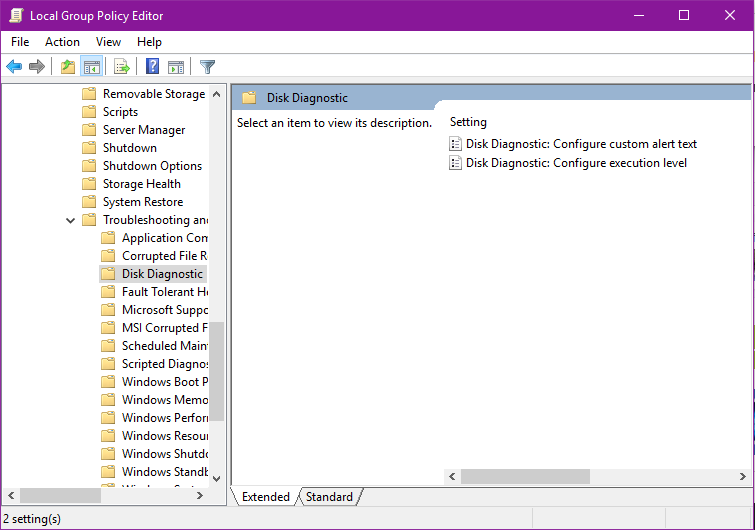 Windows slowly but surely developed a system for recovery so that you can backup your hard drive before it completely goes dead. It flashes a message on-screen that says “Windows detected a hard disk problem” to help you backup your files before repairs. First, Why Did You Receive a Hard Disk Problem Alert? 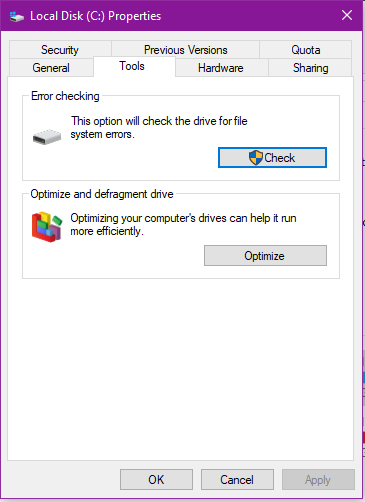 In some cases, you get this message because Windows found bad sectors on your hard drive or a faulty mechanism. At others, you receive this message because of a damaged system file or software error. A bad hard drive should be replaced by a new one, but a bad software should be corrected quickly because it may lead to sudden loss of information or computer break down. The purpose of this article is to prepare you with a number of easy to follow troubleshooting techniques. At any rate, make sure you backup your file and read on to find out how to get rid of the “Windows detected a hard disk problem” message. 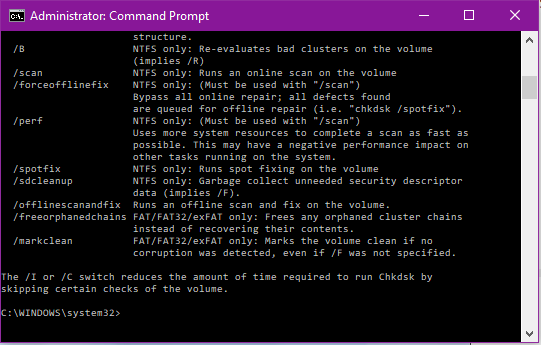 Run CHKDSK on your hard drive. There are several ways to do this. Open File Explorer Window on taskbar. Right click on the drive that you wish to check, click Properties. Go to “Tools” tab and click the “Check” button. 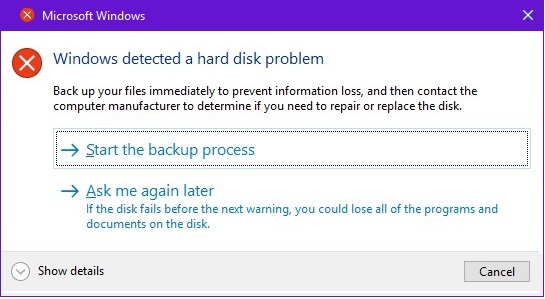 The process may run immediately if the drive is not in use, or you may need to restart the computer to complete the process. Type CHKDSK/? to choose from the list of operators the format that you wish to run i.e. CHKDSK /f, CHKDSK /v, etc. 3. Run Hard Disk Diagnostics from hardware manufacturer. Windows Surface Scanner by DTI Data. Maxtor’s HDD Bad Sectors Repair. Seagate SeaTools by the company having the same name. Data Lifeguard Diagnostic by Western Digital. System File Checker is a very helpful tool that fixes a lot of Windows errors. To run it, go to Command Prompt by typing it on Cortana, then right click on System File Checker and click run as administrator. When the command prompt comes up, type “sfc /scannow” and hit enter. Your hard drive diagnostic may show that your hard drive is ok. This means that the error report you are getting is really nothing more than Windows reporting an error from another process due to file dependencies, human error or a virus attack. In any case, you can run security check then try the following tips. Type “gpedit.msc” on Cortana or run it from the Start button, All Applications, Windows System. This should take care of the persistent error message. At any rate, make sure you backup files every now and then to avoid hassles of losing your files. Got any other tips you want to share? Comment below, readers will surely appreciate it.